The inaugural function of all subjects Association of Paavai College of Education, Teacher Training Institute and Arts and Science College for Women was held in Paavai Institutions at Visveswaraya Block on 25.09.2010, Saturday at 10.45 am with a Prayer Song. The Chairman Shri.CA.N.V.Natarajan, presided over the function and the Correspondent Smt.Mangai Natarajan of Paavai Institutions lit the kuthuvilaku. The office bearers took PLEDGE for ensuring the continuous successful functioning of the Association throughout the year. The chairman of Paavai Institutions Shri.CA.N.V.Natarajan in his presidential address said that the five faces of Paavai Symbolize the following five things Students, Teachers, Parents, Society and Government and Institution. In Paavai, we teach, tradition, culture and value education. Through this Association we should associate many activities like guest lectures, symposium, debates and so on. From that knowledge and power we can create an innovative India in forth coming days. 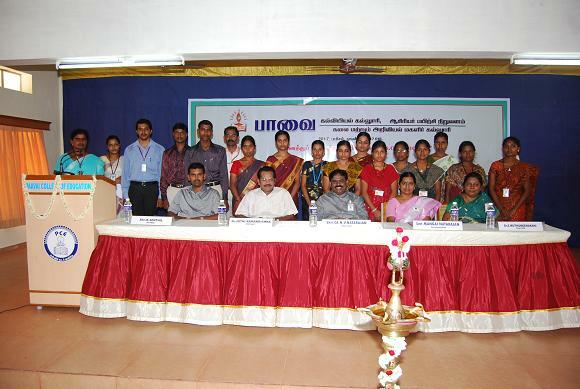 The Chief Guest Dr.Jothi Ramakrishna was introduced by the Teacher Training Institute lecturer in English Ms.R.Divya. In his Inaugural address the chief guest quoted a Thirukkural. In that, he said a man should follow the three ways in their life. That is, God's blessings, teacher's blessings and one's own ability. These three things are the traditional values of Indian life. Without these three things, we can't survive in the society. He quoted the words of Tamil poets like Bharathiyar, Thiruvalluvar, etc., and English poets like William Shakespeare, William Wordsworth, John Milton, etc., every country has its own pride. For India, it has its own Tradition, Culture and Spirituality. And also quoted from Noam Chomsky's speech that, Tamil is the origin of languages. For living, the wealth is necessary but there should be meaning for our life. To know the meaning of life, we should have knowledge and wisdom. As per the linguists, the language can be learned through 4 stages as follows. a) To be familiar with language b) Acquiring fluency in language c) Mastering over the language and d) language should become a part and partial of our life. He concluded with the words of Abraham Lincoln, we should follow love and affection to all the living creatures, morality and service. We should not give up our culture and language, eventhough we become a world citizens. The Correspondent Mrs.Mangai Natarajan of Paavai Institutions bestowed her blessings and told that, the students should be round the clock observers of the Institution. She concluded that, the student should actively participate in all the activities. Students and student teachers performed various cultural activities like dance, singing, to enrich the function. R.Krithiga, the student of Arts and Science, proposed vote of thanks. The inaugural function came to an end with the National Anthem. Motivational talk on "Come, Let us cross the sky ..." held on 9th March 2011. MUPPERUM VIZHA - Sixth Graduation, Award Noon, Annual Day & Cultural Festival held at Paavai Institutions on 5th March 2011. A special Guest Lecture on "Man Power Vs Mind Power" held on 25th Feb 2011. Sports Day held at Paavai Institutions on 24th Feb 2011. Campus Drive by Allsec Technologies, Chennai held on 31st Jan 2011. Special Lecture on "Goodness..Greatness.. Godliness" organized for Faculty members held on 28th Jan 2011. Republic Day celebration held on 26th Jan 2011. Guest Lecture on the topic "Success a Habit" By Mr. Suhas Gopinath held on 20th Jan 2011. Debate for Pongal celebration held on 12th Jan 2011. Youth Festival on National Integration to be held on 7th Jan 2011. "Road Safety Week" held on 6th Jan 2011. Special Lecture Programme on "WINGS OUT REACH TOP" by Dr. A. MURUGANATHAN held on 15th December 2010. B.Ed, Teacher Training and Arts & Science college - All Subject Association Inauguration held on 25th September 2010. Inauguration of 2010-2011 Academic Year for PAAVAI TEACHER TRAINING INSTITUTE & PAAVAI COLLEGE OF EDUCATION was held on 8th September 2010. Youth Week Festival on 2/1/15 & 3/1/15. The 65th Independence Day of our Nation was celebrated on 15th August 2011. Youth Festival on National Integration held on 7th Jan 2011. © 2019 Paavai Institutions. All rights reserved.